What?! You mean all those people may not actually BE Jesus' homies?? Astounding. Call me old fashioned but I found them offensive. It doesn't take a rocket scientist to put in the missing word. 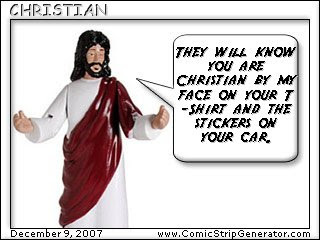 but...to prove I'm not a snob one of my past RE students who is probably going to be a priest (he's in college, now) had a bumper sticker that said, "Jesus loves you, everyone else thinks you're an a__hole! Now, that made me laugh! !